A futuristic solution to Metro Toronto gridlock. 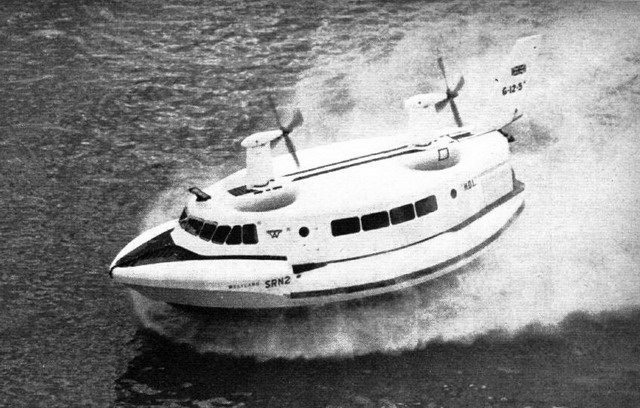 Image of the SR.N2 Hovercraft from Flight International (March 9, 1962). Imagine skimming along Lake Ontario at 120 kilometres per hour, reading the newspaper on the way to work in the city. Inching along the congested (and increasingly dangerous) Queen Elizabeth Way or the Gardiner Expressway might’ve taken you up to an hour, but instead your commute aboard a massive passenger hovercraft makes the same journey in all weather in mere minutes—and with none of the stress traffic creates. Twenty-five minutes to get downtown from Hamilton, or 11 minutes from Oakville, and just four to travel from Mimico. The spacious passenger cabin, where you’re strapped into your seats for safety (in case the vessel needs to skid through a turn at a high speed), is comfortable and protected from the spray and blasting wind of the propellers. Seconds after arriving downtown, the amphibious craft gliding up a concrete ramp at the ferry docks, you emerge through a side door and head to the office. Passengers bound for the suburbs board and, in minutes, the hovercraft is off again, blasting across Lake Ontario. This might’ve been your commute, and the future of regional transportation in Metro Toronto, if Mimico Mayor Hugh McGregor Griggs had had his way in the early 1960s. 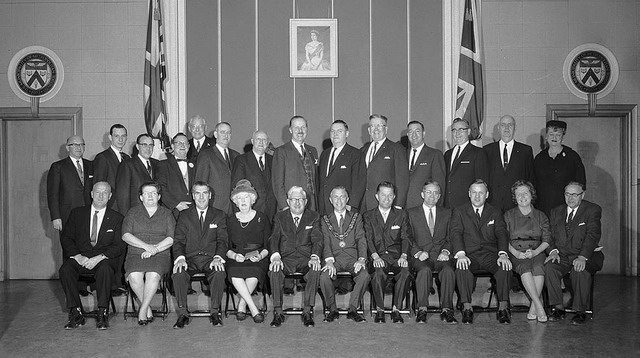 Metropolitan Toronto Council, 1962, with Hugh M. Griggs at bottom right. City of Toronto Archives, Fonds 1257, Series 1057, Item 5000. Mimico had been a Toronto bedroom community since the first streetcar line was laid in the late 19th century. After the Second World War, as servicemen returned home to purchase homes and start families, it steadily grew, from 8,785 in 1945 to 10,410 in 1951. The booming growth was typical of Toronto’s suburbs at the time; along with Toronto proper they formed the Metropolitan Toronto regional government in 1954, to coordinate in areas of common concern. A former schoolteacher and editor of the Canadian School Journal before entering municipal politics, the new mayor became intrigued by an emerging technology making waves in the United Kingdom: the hovercraft, a vessel capable of travelling over sea or land on a cushion of high-pressure air. Although the technology had only progressed to the prototype stage, Griggs thought it had potential as a means of relieving his constituents’ daily commute to the city core. Image of the SR.N2 (left) and SR.N1 (right) Hovercrafts from Flight International (March 9, 1962). The modern hovercraft emerged from the backyard experiments of Sir Christopher Cockerell, who built several working models in the 1950s. When the British military showed no interest in the technology, Cockerell’s designs were declassified by the British government for development by the National Research Development Corporation (NRDC), the body tasked with turning promising inventions into viable commercial enterprises. In October 1958, under contract to the NRDC, the Saunders-Roe Division of Westland Aircraft Ltd. began work on a full-scale hovercraft prototype. The SR.N1, as the small vessel was called, first flew in early June 1959, and just over a month later made a successful crossing of the English Channel. 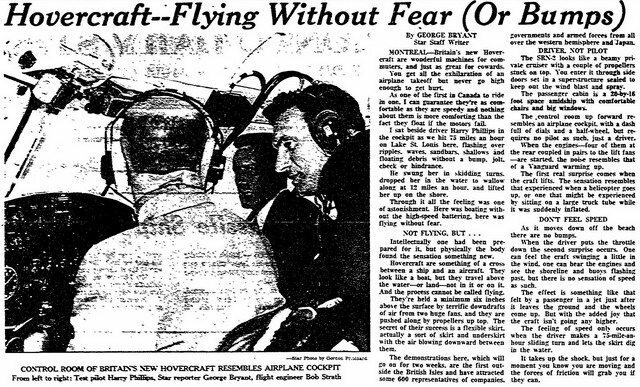 That well-publicized event, and a subsequent test piloted by Prince Philip, caught the public’s imagination, and further hovercraft developments were widely reported in the world press. By 1961 it was no longer a question of whether the hovercraft’s ground effect principle worked. The challenge was now whether the companies could prove the hovercraft was more than a novelty—that it had the potential to carry large numbers of people or cargo at great speed over long distances, and at a reasonable operating cost. So when Saunders-Roe received correspondence from a small-town Canadian mayor, the company took the inquiry seriously, mailing him studies and research information. “On the face of it, it seems Air Cushion Vehicles could play an important part in the over-all transportation pattern in the Toronto area,” F.R. Drew of Saunders-Roe later told a Toronto reporter. Armed with this material and the company’s encouragement, Griggs made a presentation at a meeting of the Metro Roads and Traffic Committee in November 1961. “Let’s set up a committee,” he explained, “to take a serious look at this British Hovercraft—I think it could be the answer to all our problems.” Metro officials laughed, thinking his futuristic, “flying saucer” proposal to be nonsense. Griggs found an ally in aviation reporter Kerry Gibbens. 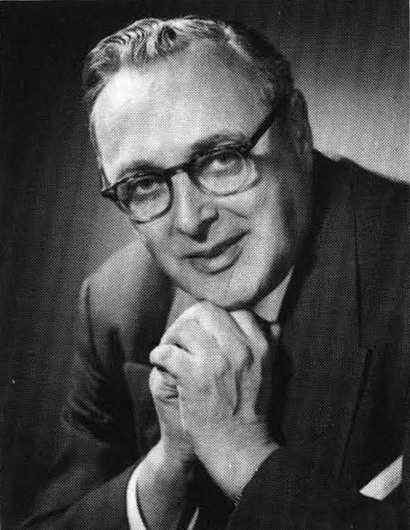 “[T]he major design problems have now been licked,” Gibbens argued in a profile of Griggs’ hovercraft scheme in Canadian Magazine (July 1962), “and within two years it could become the logical answer to commuter transport problems in Toronto—and in every other major Canadian city with urban areas spread along accessible waterfronts.” He suggested Vancouver, Montreal, and other cities with significant waterfronts might follow Toronto as early adopters of the hovercraft. At the time Griggs pitched the Metro Roads and Traffic Committee, Saunders-Roe’s prototype for a larger, faster hovercraft capable of carrying 50 or more passengers (the SR.N2) had not yet been tested at sea. But subsequent successful tests of the SR.N2 confirmed its commercial promise. Hovercraft companies also began solving the problems they’d faced in early designs. Flexible skirts to contain the compressed air and improve lift and stability over obstacles or rough waves, for instance, made passenger service more practical. Finally, in July 1962, the first hovercraft operating as a passenger ferry—the Vickers VA-3—entered regular service, carrying up to 25 passengers across a 27-kilometre route between Merseyside and Wales on the River Dee. Suddenly, Griggs’ futuristic idea didn’t seem so far-fetched. Toronto Star (April 30, 1963). In late April 1963, the SR.N2 Mark 2 was unloaded in Montreal for two weeks of live demonstrations, the first held outside of the United Kingdom. Griggs and other Metro Toronto officials were among those in attendance at the trials on Lake St. Louis and along the St. Lawrence River—a crowd of 600 that included representatives of commercial firms and armed forces from across the Western Hemisphere, as well as from governments from as far away as Japan. Toronto Star reporter George Bryant took a test run. “As one of the first in Canada to ride in one,” he said. “I can guarantee they’re as comfortable as they are speedy.” He described the passenger compartment, sealed to protect from the wind and spray, as spacious. The control room, he said, resembled an airplane’s cockpit. Others who travelled by hovercraft in Britain in the 1960s and 1970s, however, would question whether the mode of transportation lived up to its billing, commenting on the loud engines and the need to be strapped into one’s seat. Clarence Downey and H.E. Pettett, chairman and secretary of the TTC respectively, also had the opportunity to take a test flight. Their presence indicates how seriously Metro Toronto was contemplating acquiring one of the crafts, which came with a $1,351,000 price tag but could carry 150 passengers at a cruising speed of 130 kilometres per hour. Saunders-Roe, newspapers noted, could deliver an operational hovercraft in no more than a year. But no hovercraft was ever ordered. Toronto Star (May 4, 1963). Meanwhile, in the United Kingdom, hovercrafts became a regular feature of the transportation landscape. More and more of them entered regular passenger service, crossing The Solent to the Isle of Wight, connecting Weston-super-Mare and Penarth on opposite banks of the River Severn, and spanning the English Channel to France, among other routes. Ambitious designers introduced ever larger and more powerful designs throughout the 1960s, leading Cockerell to speculate that his invention might eventually take shape as a 10,000-ton ocean liner, zipping across the Atlantic in 30 hours. Late in the decade, Cockerell was at work on a “hovertrain,” a concept that aimed to apply the same air-cushion principles to the railway, but which petered out by the 1970s. In Toronto, Griggs continued stumping for hovercrafts for years. In 1963, when construction of a subway line beneath Queen Street was being debated, Griggs predicted that the purchase of a hovercraft would make subway expansion unnecessary. 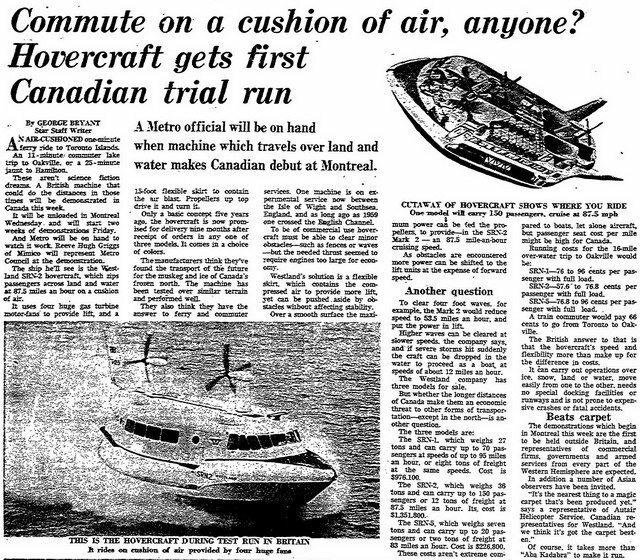 Speculating with gathered journalists on the benefits of regular hovercraft service, Griggs confidently asserted that 15 hovercrafts could be ordered for $20,000,000—the cost of 1.6 kilometres of subway. When Parks Commissioner T.W. Thompson, speaking off the cuff, told a group of Metro officials that hydrofoils might be an option to replace standard ferry service between the mainland and Toronto Island, Griggs took the opportunity to again redirect public discussion to the topic of hovercrafts. 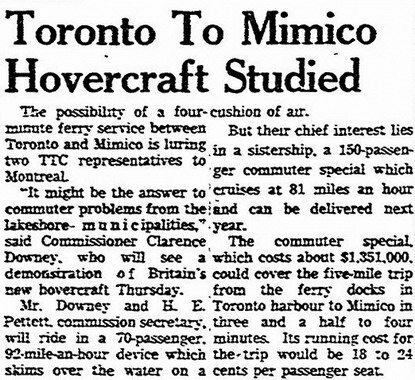 As late as 1966, speaking at the Lakeshore Kiwanis Club, he urged Metro Toronto to divert some of the funds being spent on regional expressways to the procurement of a giant commuter hovercraft. Photo of the SR.N4 Hovercraft, October 2000, by Andrew Berridge from WikiMedia Commons. 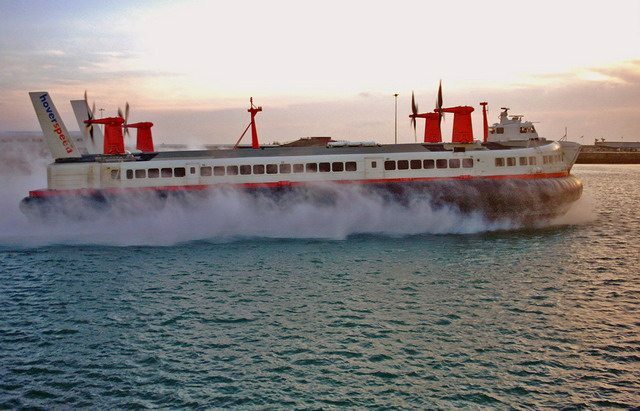 Although Griggs’s efforts came to naught in the 1960s, hovercraft passenger service was eventually initiated on Lake Ontario in July 1974 with the Toryoung I and Toryoung II. The service quickly proved popular, carrying 14,000 passengers between Toronto, Niagara-on-the-Lake, and Youngstown, New York, in August 1974 alone. But the service was discontinued shortly afterward when, in mid-September, the Toryoung II hit a buoy and nearly sank. The circumstances of another accident in February 1987—when several policemen and firefighters responding to an ice-boat accident on Burlington Bay became trapped in freezing water and were rescued by a Toronto man demonstrating his recreational hovercraft nearby—prompted numerous Ontario police and fire departments, including the Metro Police, to investigate the use of small-scale hovercraft as rescue vehicles. This, whether by police and fire services or the Canadian Coast Guard, has remained the most common use of hovercrafts in Canada today. But the idea of passenger hovercraft service on Lake Ontario has never disappeared entirely. In February 1991, with the backing of the provincial Ministry of Transportation and the Toronto Harbour Commission, a group of private consultants undertook a study of the feasibility of a rush-hour ferry service using hovercrafts, hydrofoils, or catamarans, running year-round between Toronto and the Niagara Peninsula. The same year, another company in Burlington, Transportation Alternatives, hoped to operate a commuter hovercraft service from Port Weller to Toronto. More recently, brothers Dale and Ryan Wilson of Hover Transit Services first sought to purchase two retired hovercraft ferries from a British museum in 2004 in order to establish commuter routes on Lake Ontario to the east and west of Toronto. Then, in the spring of 2008, Hover Transit Services next proposed using a second-hand passenger hovercraft to revive the fast ferry service linking Toronto and Rochester that had previously failed in 2004 and 2006—with hopes the venture might eventually lead to commuter service for Toronto. None of these proposals were ever implemented. Sources consulted: Kerry Gibbens, “A Flying Saucer for Toronto?…Why Not!” Canadian Magazine (July 1962); Bill Gunston, “Stepping Stone to the Economical Hovercraft,” Flight International (March 9, 1962); and articles from the Canadian Press (July 9, 1991; and July 15, 2008); Globe and Mail (November 28 & 29, July 24, September 29, 1962; and April 9, 2008); National Post (September 7, 2002); Toronto Star (July 20, September 5 & 29, 1962; April 23 & 30, May 4, 5 & 7, June 11, 1963; January 28, April 2, September 8, October 19, 1966; May 24, 1987; May 27, 1988; January 22, September 17, November 8, 1990; February 23, 1991; January 17, 2004; and January 1, 2007).